The Aerofilms company recorded one of the most tumultuous periods of British history. This gloriously illustrated book draws on thousands of aerial photographs to present a vivid picture of a nation in the first half of the twentieth century. Aerofilms Ltd was born on 9 May 1919. An unprecedented business venture, it hoped to marry the still fledgling technology of powered flight to the discipline of photography. Its founders were Claude Grahame-White, an internationally-famous English aviation pioneer, and Francis Lewis Wills, a trained architect who had flown as an observer for the Royal Naval Air Service during the First World War. Together they embarked on a distinctively British tale of derring-do. From developing photographic glass plates in a hotel bathroom at the London Flying Club in Hendon, to producing many thousands of aerial images every year, they took a tool which had first been used for military intelligence, and repackaged it for the mass market. As a result, Aerofilms lived through and recorded one of the most tumultuous periods in British history. After surviving the worldwide economic crash of the Great Depression in the 1930s, and serving their country at the request of Winston Churchill during the Second World War, they were still on hand to help shape the Britain of the future, capturing the major reconstruction projects of the 1940s and 50s. Aerofilms: A History of Britain From Above draws on thousands of images, including many that are rare or previously unseen, to present a vivid picture of the nation in the first half of the twentieth century. Following the company’s enigmatic founders, daredevil pilots, skilled photographers and innovative advertisers, it explores how they manufactured and sold a potent sense of place and identity to the British people. The story of Aerofilms – the men and women behind the company and the photographs that they produced – is a story of innovation, entrepreneurial spirit, war, marketing and the making of ‘Brand Britain’. Katy Whitaker is Cataloguing Team Leader at English Heritage, and an expert on the history of the Aerofilms Collection. Allan Williams is curator of the National Collection of Aerial Photography (NCAP) held at RCAHMS in Edinburgh, and a leading authority on the history of wartime aerial photography. Aerofilms is an astonishing black-and-white history of our fair isle from above ... it captures astounding architecture, awesome natural wonders and even the brutal imprint of war. This book tells the story of much of 20th century Britain in stunning aerial photographs. The scale and detail of rapid social, architectural and industrial changes are shown through pictures of cities, towns, coastal areas, industrial scenes and breathtaking landscapes. This wonderfully written book starts with a broad insight into the world of early aviation. 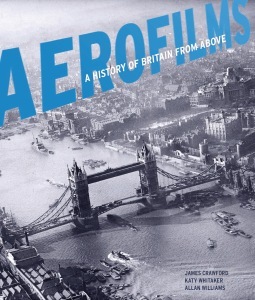 It tells the history of Aerofilms in an interesting and exciting way, illustrated by some rare and previously unseen photographs of Britain from above.